The expertise and activities of IN SITU covers scouting and promotion of artists, organisation of project laboratories and incubators, co‐productions and promotion of emerging creations, organisation of conferences and seminars, etc. 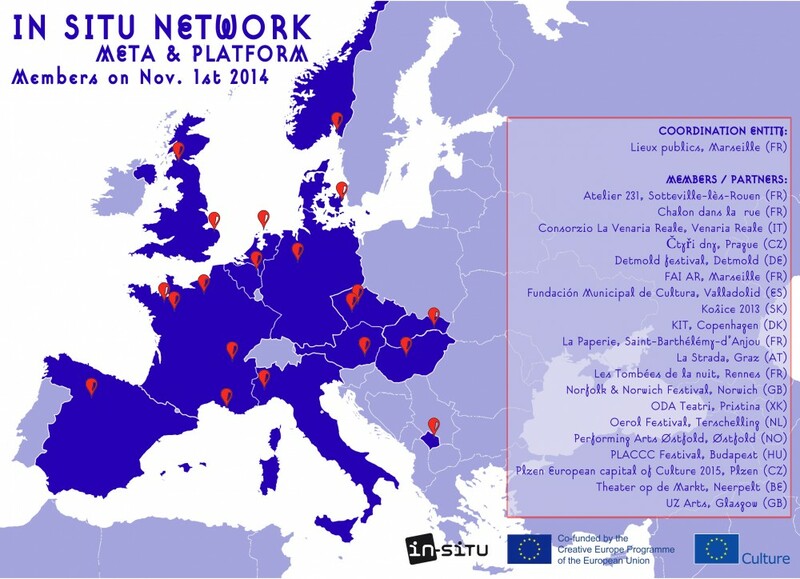 To date, IN SITU has supported over 150 European artists. It gathers 21 partners from 14 countries from as many practical and aesthetic backgrounds which all contribute something vital to the network. Whether members come from a sprawling metropolis or a rural area, whether they are seeking to rehabilitate industrial wasteland or redesign landscapes, the goal is always to serve artists working with, in and for public space. The META cooperation project ‐ supported by the European Commission ‐ fosters the development of contemporary artistic creation that reflects the dynamics at work between art, public space and the construction of European society. Highly committed projects for a larger audience are designed to discuss critically the ways in which consumption and energy are handled and to indicate possibilities for change. Continues the situationist method of artistic exploration of cities and the European tradition of going for a stroll. Nine artists from the countries of the nine META co-organisers will stroll through selected towns from centre to periphery and artistically explore them with regard to the topics of transport, new technologies and urban transformation. The city for all will be intervening artistically in communal life. Frequently failing political integration models are juxtaposed with cultural forms of coexistence which, in their creative approach, reach beyond the merely decorative prettification of social problem zones.